An ideal solution for adding lighting control to existing homes. Crestron really wants you to ditch that light switch. They are certainly making it enticing with the company’s new CLW-DELV wireless dimmers. As part of Crestron’s Cameo infiNET EX line, the CLW-DELV can provide in-wall RF dimming of incandescent, halogen and LED light sources. The company is making 120- and 277-volt versions available now, with a 230-volt model coming on April 1, 2016. 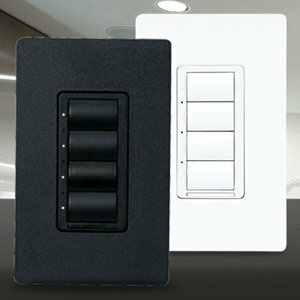 Cameo in-wall dimmers have field-replaceable, engravable buttons that can be configured with a variety of button layouts. Crestron is also making these dimmers available in a variety of colors. Crestron says that Cameo CLW wireless dimmers work in both new and retrofit applications, via infiNET EX 2.4 GHz mesh network technology. This type of install can cut down on the wiring and labor costs typically associated with installing traditional wired systems.